Good job Raven!! Too bad she didn’t know that more treats would have been tossed her way if she didn’t get it as quickly! haha. The portable bed/cot looks awesome and I like the quick and easy set up and take down. I think it would be great for my dog to get her off the hot floor in the summer time, but allow her to be outside in the shade when we have company over. When I first read the title I was about to type – Ruby knows this command. But then I read further and have to admit when we say “Ruby go to bed” she runs up to our bed. LOL. The cot looks pretty cool! Yep! My dog’s rule our bed. I’ve become a contortionist when it’s bed time. I think my body may be permanently shaped like an S with Raven curled on one side and Stetson the other. Linus liked lying across the top against the headboards. We’re using “Go To Your Bed” to try and get Raven to settle in certain situations. So far it’s working fairly well. Next I’m going to try and transfer the cue to the doorbell. The basic idea is when the doorbell rings Raven goes to her bed (instead of barking). We’ll see how it goes. I’ll report back next week! Our dog barks and rushes the front door whenever the doorbell rings. We will try to use your method of training her to go to her bed instead of barking incessantly and running to the front door. We have a yorkie. 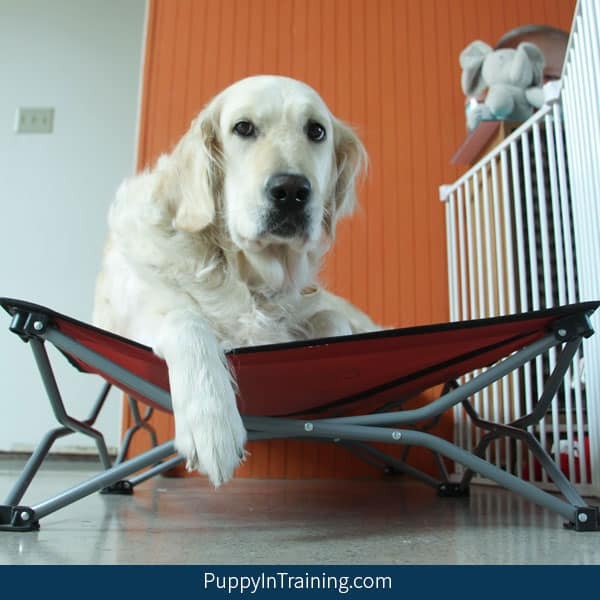 Does the Carlson portable dog cot come in a small size? I really like how portable it is and how easily it opens and closes. Yes! They have a small and a large size dog cot. The small one is about half the size of the large one. I think it would be great for Yuki and “Go To Your Bed” would also be a good behavior for her to learn. We should train the dogs in our family and maybe leave the cot at our house when the dogs visit. 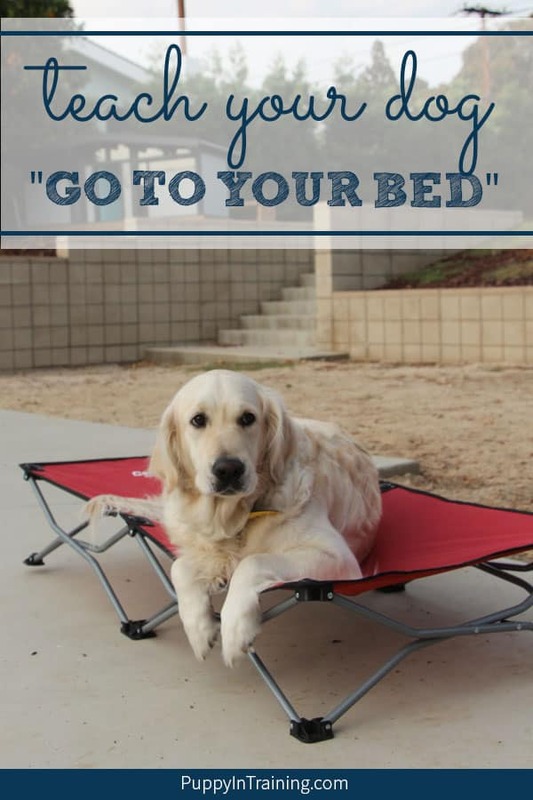 These tips will come in handy if our next canine companion does not know “go to ur bed. 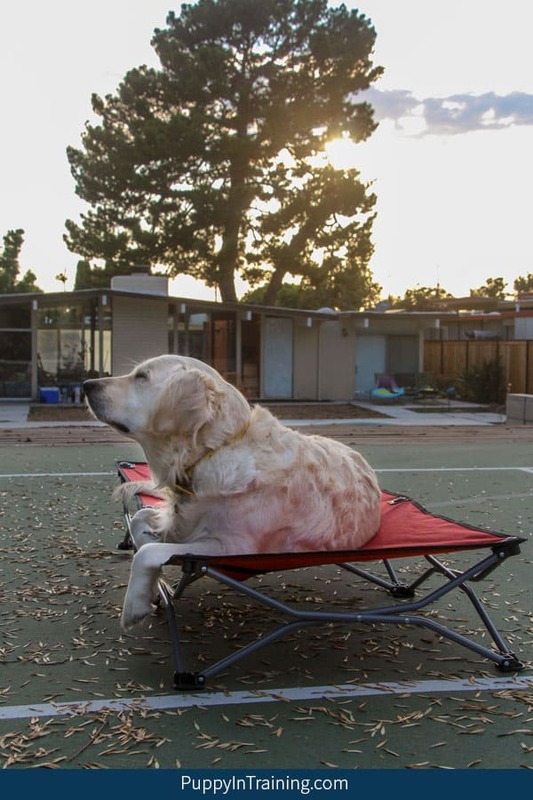 “ I like the way the Carlson Bed folds… so EZ. 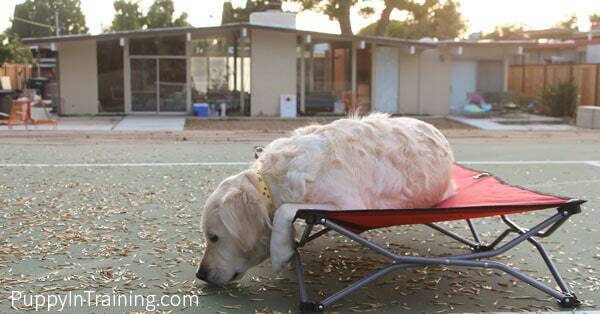 The Carlson bed folds easily and is lightweight. I bought some furniture pads to apply to the bottom, but so far I haven’t used them because I haven’t had too many issues with it slipping. We have polished concrete and that’s the only place where I’ve noticed it slides a little especially when Raven enthusiastically jumps onto her little elevated dog cot. I think old timer like Georgie might like having something to keep him off the ground. My only worry is for older dogs with arthritis it might be a little difficult getting on and off. Although Stetson is arthritic and he managed okay, but doesn’t have the same enthusiasm as Raven.